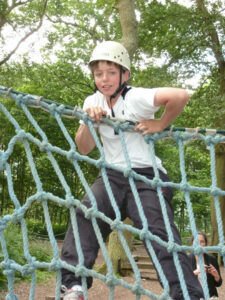 Blackland Farm is a multi-purpose activity centre offering a wide range of adventurous outdoor activities. We host residential camps both under canvas and indoors for schools and youth groups of all kinds. Day visits offer a variety of activities for both children and adults – we have birthday and hen parties, family fun visits and corporate team-building days. Blackland Farm is in the middle of the countryside in Ashdown Forest yet close to major transport links. The National Trust property, Standen House and several village pubs and restaurants are just five minutes away at Forest Row, West Hoathly and Sharpthorne. 10 minutes away are the shops in East Grinstead and Wakehust Place with millenium seed bank. The Bluebell steam railway runs close by and Weir Wood reservoir can be seen from the site. Our fully qualified instructors hold nationally recognised qualifications and have extensive experience of instructing groups of all ages and abilities. They are skilled in bringing out the best in people, especially those daring to try life outside their comfort zone.